Getting set up with cross-country gear is quick and painless. Knowing what type of skiing you want to do will speed your acquisition but rental and sales agents can easily assist undecided skiers. Cross-country skis are narrow and without edges, attached to the feet by simple integrated toe-bar bindings and soft leather boots. Choosing cross-country gear requires much less technical knowledge than downhill gear, because there are only a small number of manufacturers, all of which produce quality goods in only a couple of styles. The big questions in XC skiing are skating vs. classical, wax vs. wax less, and of course, the terrain you’ll most be skiing. Lighter skis perform the best on machine-groomed trails, while heavier wider skis provide stability and control when exploring the backcountry. Generally, skate skis are shorter and faster than classical style. Choosing wax versus waxless skis comes down to performance versus convenience. 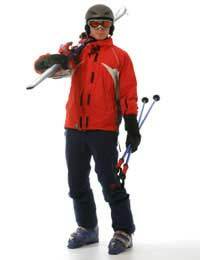 Most skiers prefer non-wax bases on their skate skis and wax on their classical skis. (The nature of the classical kick versus skating required more ski grip on the uphill.) The scales underfoot of waxless skis slide and grip well on most snow conditions, and eliminate the dilemma of incorrect waxing. However, using kick-wax allows skiers to match exactly the wax to the temperature of the snow for supreme uphill gripping. Manufacturers establish size charts to choose ski lengths by the skiers' weight and height. For classical skiers ready to try skate skis, take 10 centimeters off your classic ski length. Some stores utilize a sophisticated flex and pressure-testing device to determine a ski’s response characteristics, allowing the sales person to match perfectly the skis to the skier. If not, selecting a medium flex for your weight will suffice. A great trick to test a ski’s ability to support your weight while gripping up hills and gliding down hills, is the paper test. With a piece of paper between a hard floor and the ski, try to slide evenly weighted on both skis. Move your weight to one ski at a time; you should not be able to slide. The best part of cross-country skiing gear is the boots. Unlike alpine or tele, XC boots are all about comfort. Always try on ski boots with the socks in which you intend to ski. Fit cross-country boots like sneakers with room for your toes. Your running shoe orthotic should fit to help with alignment, if you don’t want to lay out the cash for foot beds. Classical boots are simply a basic leather boot with the binding compatible sole. Skate boots are the more performance designed style with stabilizing plastic ankle supports, and less flexibility than classical boots allowing the skier to drive the skis from the “push off” phase. High-end skate boots can be too restrictive for beginner skiers, but as in alpine boots, cross-country boots come in varying flexibilities. Lower-end skate or combination boots, for both skating and classical, may be a better choice. Poles in cross-country skiing assume more work than alpine poles, though they are still the least technological piece of a skier’s equipment. Because the poles thrust the skier forward, they need to be tall and aerodynamic. Standing still, classical poles should fit comfortably under your armpits; skate poles should reach up under your chin. Large baskets are useful if you intend to ski in soft unpacked snow; small aerodynamic baskets are for groomed trails and speed skiing. Once you’ve picked the boots, the bindings are easy, as they are integrated systems. As easy as that, you have geared up and are ready to hit the trails.